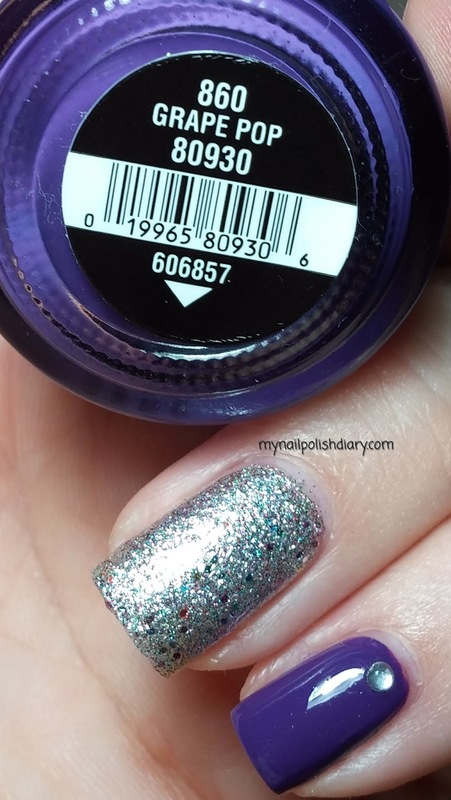 My Nail Polish Diary: China Glaze Grape Pop Skittles! China Glaze Grape Pop on both the index and pinky. China Glaze Liquid Leather on the middle finger with Zoya Purity for the dots I free handed with a dotting tool. China Glaze Polarized on the ring finger. I used a a single rhinestone on the pinky I got from my friend Kim. She and I met recently and discovered we share a love of all things nail related. That was an awesome day. And a blog post for later! So, thanks Kim for the rhinestones! I love using them!